Shown is the First Stop gas station at Allensburg on U.S. Route 50 near Lynchburg. Authorities are seeking a male suspect in an armed robbery at the Allensburg First Stop that occurred Sunday night. Highland County Sheriff Donnie Barrera told The Times-Gazette that the suspect, who cops say used a pistol to rob the gas station on U.S. Route 50 near Lynchburg around 8:30 p.m. Sunday, is considered armed and dangerous. Barrera said in a press release Monday that the suspect was clad in a red hoodie and red bandanna at the time of the robbery. The sheriff said there was no further description of the suspect. 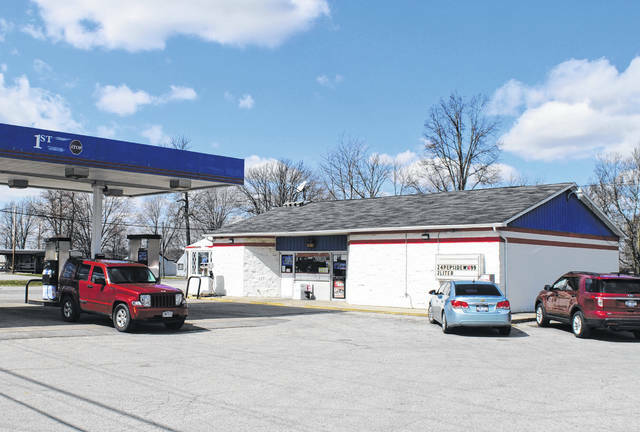 According to the press release, authorities received a report of the robbery at 8:37 p.m., and an initial investigation found that the suspect entered the store with a handgun and took cash while holding the clerk at gunpoint. Barrera did not disclose the amount of cash taken. The sheriff said investigators have reviewed security footage of the incident and are looking for leads. Those with info are urged to contact the Highland County Sheriff’s Office at 937-393-1421, or, for anonymous tips, call or text TIP411. The Allensburg First Stop is located on U.S. Route 50 near SR 135 in Western Highland County.